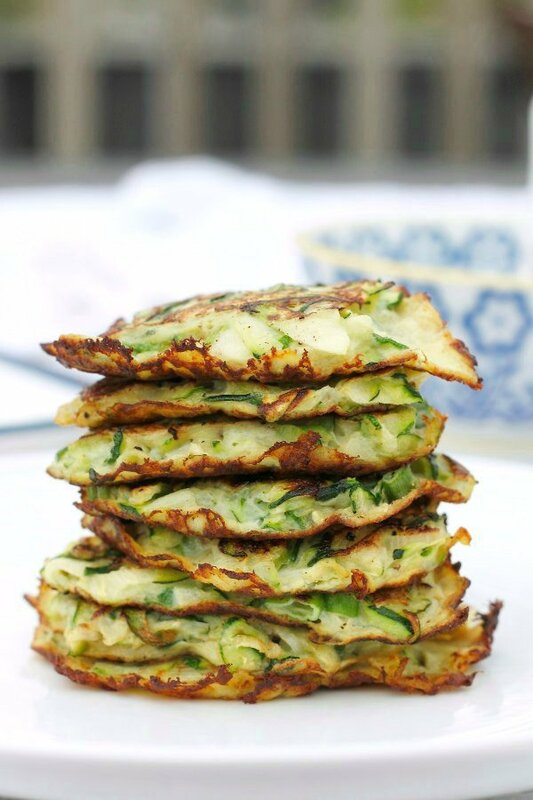 These are the easiest and healthiest savory pancakes ever. I’ve been making them for dinner at least once a week since my mom first made them this past summer. 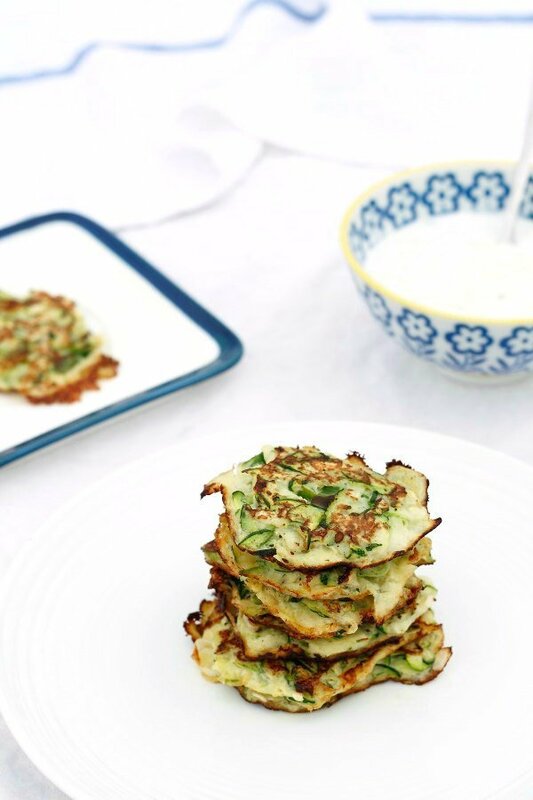 The basic recipe only requires four ingredients – one zucchini, one egg, a mere tablespoon of flour, and oil for frying. Then you can go crazy with add-ins! Scallions really boost the flavor, plus fresh herbs, crumbled cheese (think goat and feta), spices, and toasted sesame seeds. I found that omitting salt until the very end makes these pancakes much easier to fry. 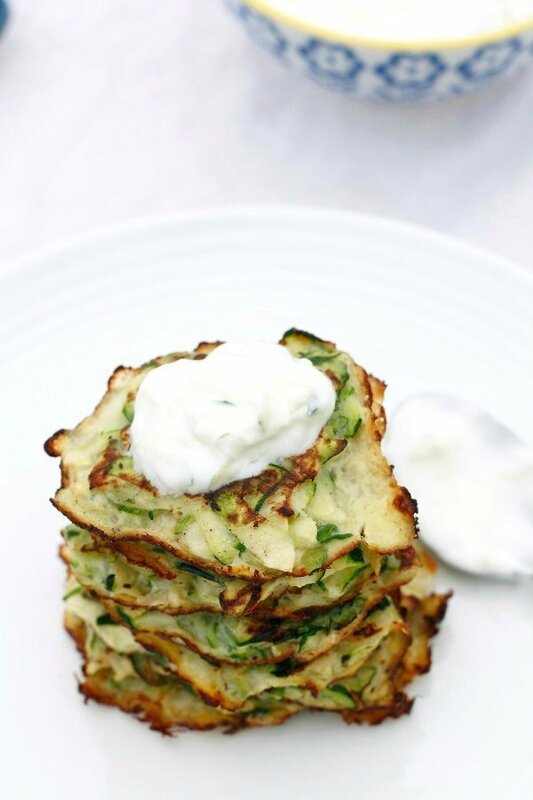 Salt draws water out of chopped zucchini and thins out beaten eggs, so I only sprinkle salt on the pancakes after I’ve dropped spoonfuls of batter in the pan. Otherwise, if you add salt to the batter and let it sit for even a few minutes, it will turn into a puddle, and we want our batter to remain relatively thick. It’s also easier to flip lots of little pancakes than one big one. My taste testers for this post both said the pancakes were delicious, and they didn’t even get to eat them fresh! Pri ate one cold and Kat ate them reheated, but you should definitely eat these fresh, before the zucchini starts to release too much liquid. Grate the zucchini onto half of a tea towel, cover with the other half, and pat well to soak up the moisture. 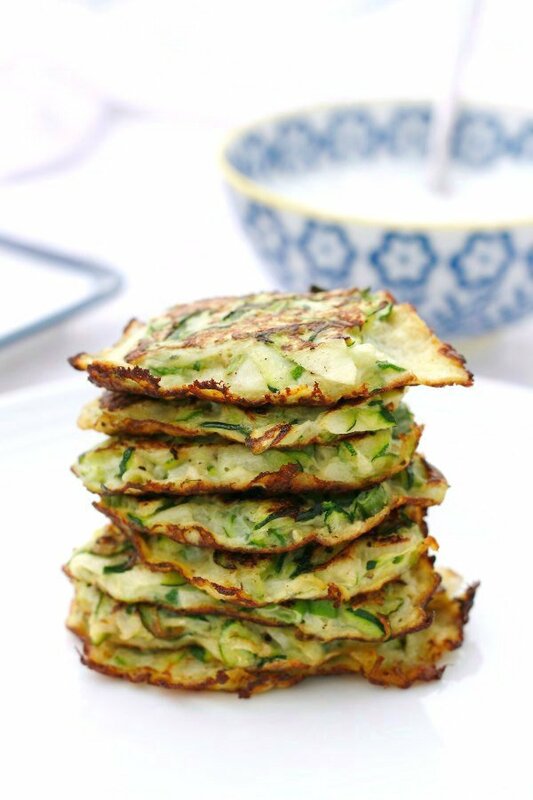 Beat the egg, add the grated zucchini and scallions, and sprinkle the flour on top. Stir the mixture until evenly incorporated. Heat one tablespoon of oil at a time in a large nonstick frying pan over medium heat. Wait at least 3 minutes for the pan to heat up. Drop heaping tablespoons of batter into the pan and gently press any lumps down with the back of a spoon. Keep two inches of space between each spoonful of batter. Sprinkle a pinch of salt over each pancake. Cook for 2-3 minutes on each side, then drain on paper towels. Peel and shred the cucumber into the Greek yogurt, then stir to combine. Season with freshly ground black pepper to taste. Thanks for sharing the recipe – these were so good, even with tapioca flour! I ate them with Nom Nom Paleo’s Sriracha and they disappeared so fast, I wish I made a triple batch. Pro tip: don’t taste these while cooking – you might just end up with an empty serving plate when your done cooking. Hi Thea! I’m so glad you enjoyed these so much haha. And thanks for sharing that it can be made with tapioca flour – very helpful for our gluten free friends here! So fresh and healthy looking. 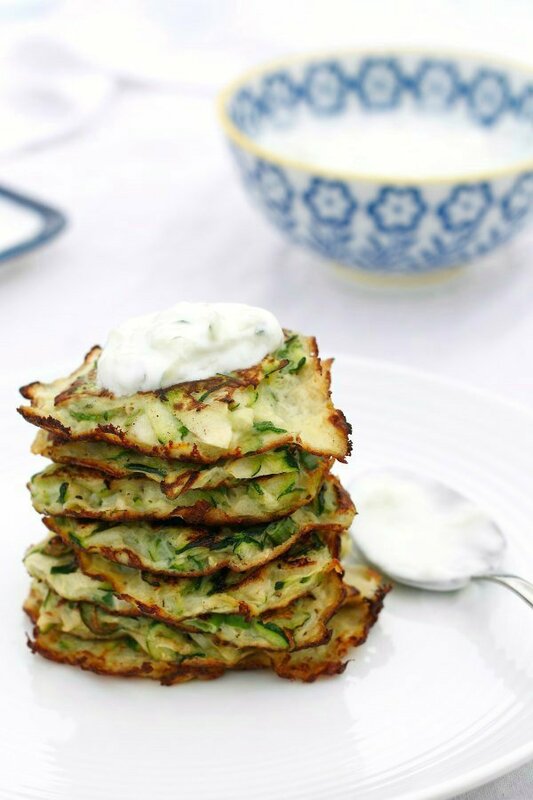 love the idea to pair the pancakes with the cucumber yogurt dip. Yumm!! These pancakes look supaaaa delicious! ! Love it!